We finally have our full SVCC Kids Sunday schedule up. If you have not signed up your kids yet, do so now before Kids Sunday fills up. You can choose any combination of our 4 kids workshops happening all day Sunday, but you'd better hurry because workshops are filling up fast. 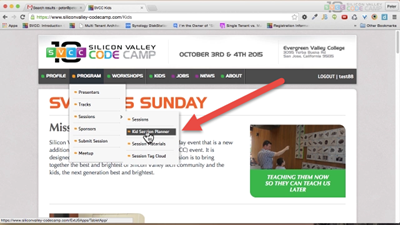 Once you register your kid, it's important you pick the kid workshops from the 4 at each time slot. Included with the signup fee is a personalized completion certificate for your kid as well as a catered lunch. To be extra clear on how to sign up and register for kids workshops, here is a 5 minute video that takes you through the process. 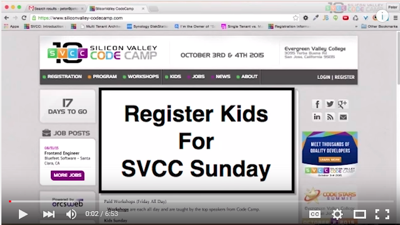 More information can be found on SVCC Sunday Kid's Director Arun Gupta's blog. PS: We are scheduling all our Professional Sessions this weekend and plan on publishing the full schedule (close to 200 sessions) on Tuesday so stay tuned!